This Gold’s Gym Challenge participant uses his new lifestyle to set a positive example for his family and the social media audience who follows his journey. For most of Maurice “Mo” Monroe’s life, his weight wasn’t a problem. As an active kid growing up in Yuba City, California, he played basketball from elementary through high school and could eat whatever he wanted: mac and cheese, fried chicken, Chinese takeout. After college, Mo enlisted in the military, and in 2010, when he was expecting a baby with his then-wife, he put on a few pounds of sympathy weight. He added even more between 2012 and 2015, indulging in hearty helpings of the local food and wine while stationed in Italy. At the time, he hardly noticed the weight gain. “I never really looked in the mirror to see how much I changed,” Mo says. While looking through family vacation photos, Mo came across an unflattering shot of himself in a muscle T-shirt. His belly looked round — he was stunned. And he decided to do something about it. 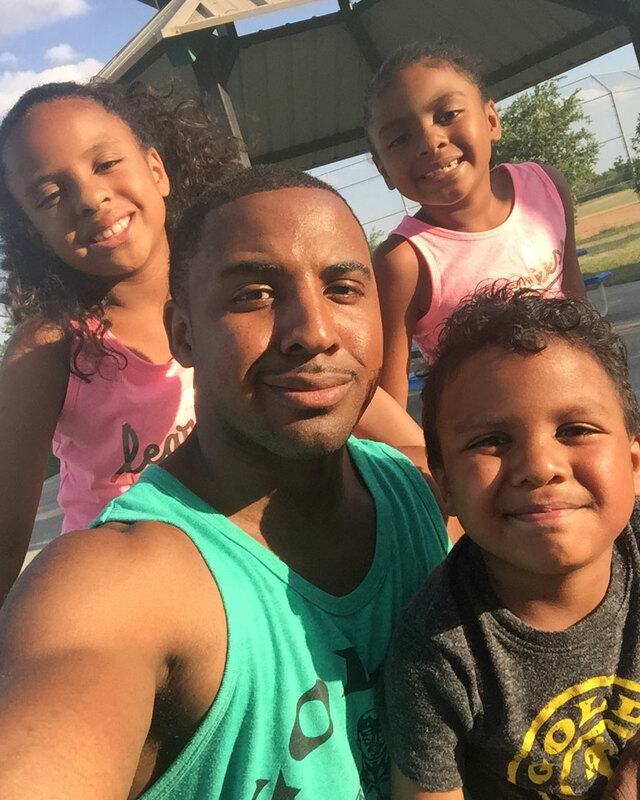 In 2016, with three children — daughters Jaliyah and Jakari, and son Jakobe — and having just moved to San Antonio, Mo didn’t think he had the time to work out. But he did think about some of the health problems that are common in his family: diabetes, high blood pressure, cancer. Mo started by going on early morning runs. When he learned that the Gold’s Gym near his house had a Kids Club, this father signed up. This way, he could work out while his kids played games, colored and watched movies. Through cardio alone, Mo lost 25 pounds. Gold’s Gym trainers gave him additional weight loss pointers, and he began monitoring his macros and preparing healthy family meals. He gave up fried foods and switched to lean proteins, brown rice and leafy greens. He started lifting weights, hoping to put on muscle. In January 2017, Mo signed up for the Gold’s Gym Challenge. There was new component of the Gold’s Gym Challenge that year called “Document Your Journey,” where participants were encouraged to post progress pics, quotes, tips, and videos to document their healthy lifestyle change during the 12 weeks. Every day for the 12 weeks of the Challenge, he posted pictures and videos of his workouts, meals and daily inspiration to Instagram. In one video, he and Jaliyah perform cardio moves in their living room. In another, she’s perched on his back as he does push-ups. By the end of the Challenge, Mo cut his body fat from 12.4 to 8.1 percent, gained seven pounds of muscle and was declared a winner in the Document Your Journey contest. “Along the way my why for working out changed,” he posted on the second-to-last day. “I never realized who was watching me work out cause a lot of the likes I get are spam or from people I don’t know. But as days went by I would get messages from people telling me to keep on pushing or that I was their inspiration to become healthy. The momentum hasn’t slowed down. In a typical week, Mo alternates muscle groups, working legs, chest, abs and arms on different days. He does cardio on the weekends and is a regular at Gold’s Gym BODYPUMP classes — keeping his Instagram followers posted every step of the way — all while continuing his military service. Mo says he’s not worried about unflattering vacation photos any more. But most importantly, this father’s weight loss and dedication to a healthy lifestyle change has helped instill that same value in his children. A lot of the family’s free time is spent being active together: They love running outdoors, going to trampoline parks and playing basketball. Jaliyah and Jakari both participate in karate. Mo’s ultimate goal is to stay in good shape, so he can keep up with his family. He hopes that when his kids are in high school, he’ll still be able to go for runs with them. “At the end of the day, we all want to live a longer life for our kids,” he says.